(PhysOrg.com) -- The stars we see today weren't always as serene as they appear, floating alone in the dark of night. Most stars, likely including our sun, grew up in cosmic turmoil  as illustrated in a new image from NASA's Spitzer Space Telescope. Cygnus X, which spans an area of the sky larger than 100 full moons, is home to thousands of massive stars, and many more stars around the size of our sun or smaller. 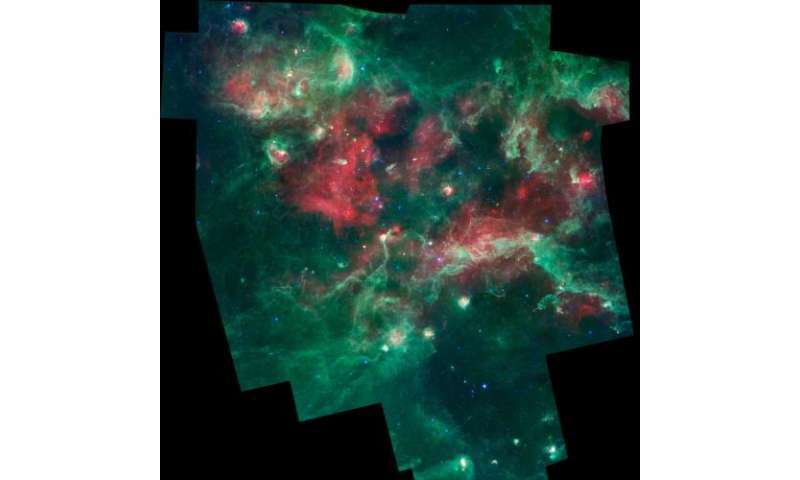 Spitzer has captured an infrared view of the entire region, which is bubbling with star formation. "Spitzer captured the range of activities happening in this violent cloud of stellar birth," said Joe Hora of the Harvard-Smithsonian Center for Astrophysics, who is the principal investigator of the research. "We see bubbles carved out from massive stars, pillars of new stars, dark filaments lined with stellar embryos and more." The majority of stars are thought to form in huge star-forming regions like Cygnus X. Over time, the stars dissipate and migrate away from each other. It's possible that our sun was once packed tightly together with other, more massive stars in a similarly chaotic, though less extreme, region. The turbulent star-forming clouds are marked with bubbles, or cavities, which are carved out by radiation and winds from the most massive of stars. Those massive stars tear the cloud material to shreds, terminating the formation of some stars, while triggering the birth of others. "One of the questions we want to answer is how such a violent process can lead to both the death and birth of new stars," said Sean Carey, a team member from NASA's Spitzer Science Center at the California Institute of Technology. "We still don't know exactly how stars form in such disruptive environments." Infrared data from Spitzer is helping to answer questions like these by giving astronomers a window into the dustier parts of the complex. Infrared light travels through dust, whereas visible light is blocked. For example, embryonic stars blanketed by dust pop out in the Spitzer observations. In some cases the young stars are embedded in finger-shaped pillars of dust, which line the hollowed-out cavities and point toward the central, massive stars. In other cases, these stars can be seen lining very dark, snake-like filaments of thick dust. Another question scientists hope to answer is how these pillars and filaments are related. "We have evidence that the massive stars are triggering the birth of new ones in the dark filaments, in addition to the pillars, but we still have more work to do," said Hora. "The biggest results from this survey are yet to come." Infrared light in this image has been color-coded according to wavelength. Light of 3.6 microns is blue: 4.5-micron light is blue-green; 8.0-micron light is green; and 24-micron light is red. These data were taken before the Spitzer mission ran out of its coolant in 2009, and began its "warm" mission. The majority of stars are thought to form in huge star-forming regions like Cygnus X. We still don't know exactly how stars form in such disruptive environments. So despite all the fanfare of this being a vigorous star-forming region, there is zero evidence that stars form from clouds of dust. I really wish those who report or do the research would ensure that articles like this are honest instead of being as misleading as this one. The only supporting evidence would be hundreds of thousands of images of exactly the same region, taken over a time span of decades. These would then be available for analysis to see what actually happens in such clouds. To date, I am not aware of any such endeavour that has shown stars in formation. This article is merely spreading dis-information. To date, I am not aware of any such endeavour that has shown stars in formation. Probably you are unaware because you haven't bothered to look. KevinRTRS, why do you find it necessary to lie for your god(s)?